The town of Islamberg has long been the target of unfounded suspicions. 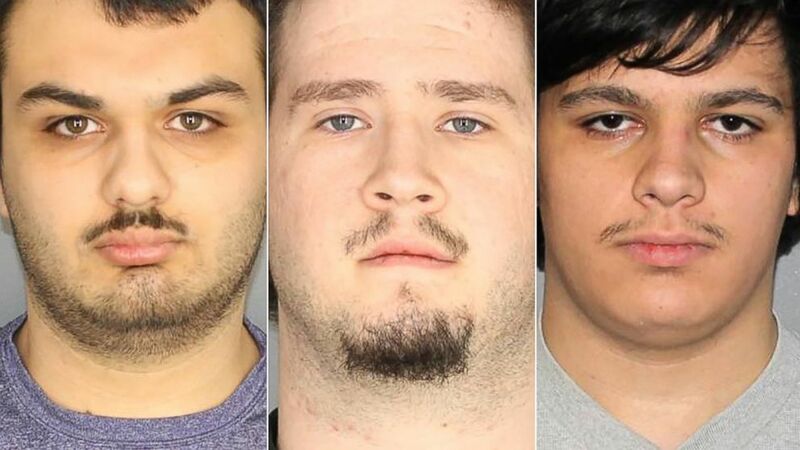 Four suspects are under arrest in upstate New York and charged with an alleged conspiracy to use improvised explosive devices and guns to attack an Islamic community about 170 miles away -- just outside of Binghamton. Three of the individuals arrested were identified by police as Vincent Vetromile, 19, Andrew Crysel, 18, and Brian Colaneri, 20. Each was charged with three counts of first-degree criminal possession of a weapon and one count of fourth-degree conspiracy. A fourth male, 16, was also arrested in the alleged plot but is not being named or identified by photo due to his age. The same charges have been filed against the teenager, according to Greece Police Department spokesman Sgt. Jared Rene. All four of the suspects were in the Boys Scouts of America together -- two of them were Eagle Scouts, Greece Police Chief Patrick Phelan said at a Tuesday press conference, according to ABC News Rochester affiliate WHAM. There was a plan to attack this community with weapons. The student who was shown the picture alerted school security, which led to an investigation. Both the student with the phone and the person pictured on the phone – who is not a student -- were interviewed by police, authorities said. Phelan said that five search warrants were approved by a judge and executed, one at each of the four suspects’ homes and one at the home of a fifth individual who has not been charged, according to WHAM. He said that three IEDs and 23 guns were recovered. "There was a plan to attack this community with weapons," Phelan said at a press conference, WHAM reported. "They had access to these weapons," Phelan said. "Some of them were their father's, some were their grandfather's, some of them I think they purchased themselves. So I think as far as ownership, I think that every spectrum is hit." (Greece Police Department) Vincent Vetromile, Brian Colaneri and Andrew Crysel in police handout photos. All three of the IED devices were recovered from the home of the 16-year-old, who is a student at Greece Central School District, Phelan said. Authorities said that the suspects were engaged in a plot to attack Islamberg, New York –- a Muslim enclave 50 miles northwest of Binghamton in the Catskill Mountains in Delaware County, New York. The tiny town of about 200 people has long been the subject of unsupported claims of terrorist activity by right-wing media outlets and commentators. According to court records reviewed by WHAM, each of the suspects is accused of having IEDs in cylinders or mason jars, packed with nails, BBs and black powder. All three of the named suspects were arraigned and are being held in the Monroe County Jail on $50,000 cash bails or $100,000 bonds. The fourth suspect was arraigned in juvenile court and detained pending a $1 million bail. All four are scheduled to return to court on Jan. 23 at 11 a.m. Authorities said the plot had been in the works for several weeks, and that further arrests or additional charges could result from the ongoing probe. Islamberg was founded in the late 1980s by a Pakistani cleric named Mubarak Ali Gilani, largely to house African-American Muslims from Brooklyn. It has been a focus of unproven suspicion for years, according to local media reports. We are also incredibly grateful that young people refused to stand idly by. Students trusted their instincts and what they have learned from us in school. ... These students came forward with information -- supporting the idea that if you see something, you should say something. Their actions changed the narrative. Alex Jones’ website InfoWars sent a pair of staffers to Islamberg in 2015 to “look into reports that the area is a staging ground for Jihadist training,” according to the Infowars website. In 2017, Robert Doggart of Tennessee was sentenced to nearly 20 years in prison for plotting to burn Islamberg down, according to Reuters. Doggart's attorneys have reportedly filed an appeal in his case. At the press conference, Greece Central School District Superintendent Kathleen Graupman made a point to commend the student or students who reported the incident to authorities. "As a school district and a community, we are deeply saddened and upset by what this investigation has revealed, but we are also incredibly grateful that young people refused to stand idly by," she said, according to WHAM. "Students trusted their instincts and what they have learned from us in school. ... These students came forward with information -- supporting the idea that if you see something, you should say something. Their actions changed the narrative."